Me again, emerging from the heat wave that took over NYC last week and feeling motivated to spend time over a hot stove/in a hot little kitchen. After the most amazing day exploring Brighton Beach & Coney Island yesterday, all I wanted to do was bring back that fresh, summer feeling back into my meals. I took to Instagram to see what you wanted to see & eat—I offered one vegan option and one not-vegan option, and while the non-vegan option won, I'm still going to provide both recipes! In a large sauté pan or skillet over low-medium heat, sauté green onions and garlic until soft, about 2-3 minutes. Add in ground beef, and break it up with your cooking spoon [I like to use wooden spoons] so that it can cook evenly in the pan. Add in spices, Sriracha, and salt/pepper to taste, mixing it in with the beef to make sure it's thoroughly combined. Continue to break up the meat as it cooks. It will take about 10-15 minutes, depending on your stove top, to get the meat completely browned & cooked through. While the beef cooks, you can prepare the slaw ingredients. In a small mixing bowl, add in all slaw ingredients and toss with tongs or a spoon to coat evenly. Make sure you taste it—you can add more Sriracha or more maple syrup, depending on how spicy or sweet you like it! When the beef is done cooking, turn off the stove and take the pan off the heat to let the mixture cool a bit [you can simply move the pan to another burner]. Rinse your lettuce and pat dry with a paper towel [no one likes a soggy wrap]. 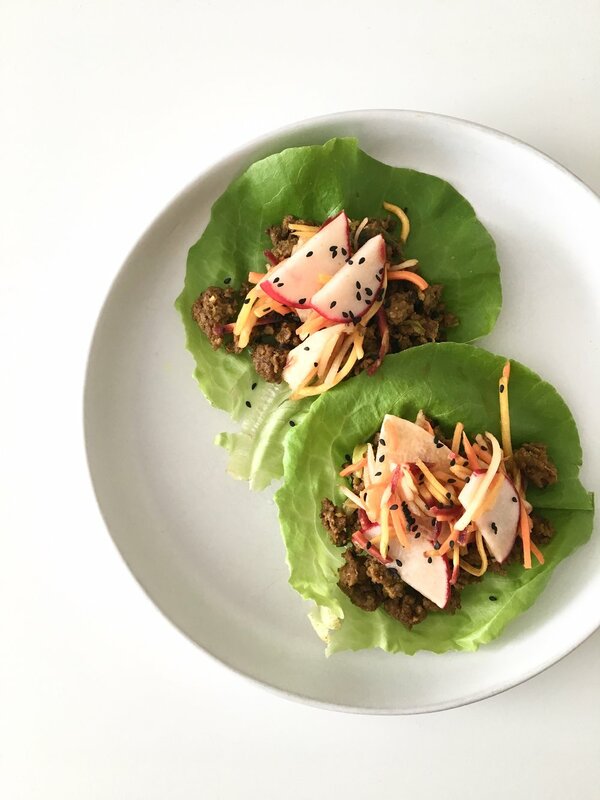 Lay down a couple of pieces of lettuce on your plate, fill with beef & top with slaw, and garnish with black sesame seeds or any other topping—you can try avocado, chopped cashews, or more Sriracha and tamari! Hungry yet? Raise your hand if you can't wait for dinner tomorrow!